The Dolphins traveled to Foxborough, Massachusetts for what was supposed to be an intense rivalry game, ended up being a one-sided contest, the final score was 38 to 7. Dolphins were undefeated at 3-0 coming in to this game while the Patriots were 1-2. From the opening kickoff it was a total beatdown. The Patriots were having their way from the first quarter until the end of the game. The Dolphins played like they were 1-2, while the Patriots looked like they were undefeated. They were moving the ball with ease, whether it was on the ground or through the air. It was 24 to zero by halftime, and Dolphins didn’t score until the fourth quarter. Overall, Tom Brady had a pretty good game passing for 274 yards, three touchdowns, two interceptions, completing 23 passes on 35 attempts (65.7%). Sony Michel had an excellent rushing game with 112 yards and a touchdown. Although the Dolphins defense was able to hold Gronkowski to only 44 receiving yards, Brady was able to find other targets to throw to. On the other hand, the Dolphins stalled out drive after drive and couldn’t find ways to answer the Patriots drives. 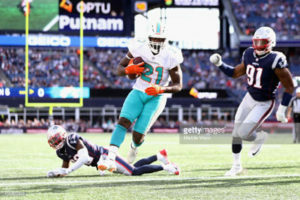 The running backs could not find ways to gain any yards, Frank Gore led the running backs with 41 yards rushing while Kenyan Drake and Kalen Ballage had a total of six yards rushing. Before Ryan Tannehill left the game, he had an average game going 11/20 with 100 passing yards and an interception. Brock Osweiler threw the Dolphins only touchdown pass to Frank Gore. Everything that could go wrong ended up going wrong for the Dolphins that afternoon. Not only could they not move the ball, they couldn’t get any stops either. Injuries to key players have also played role, as a few practice squad players had to be called up to the main roster because the starters are out. However, in sports, there are no excuses! The next man up must be ready to step in. Compared to the Patriots the Dolphins shot themselves in the foot yesterday with penalties. The Dolphins had 10 penalties for 89 yards while the Patriots only had 6 penalties for 57. On a brighter note, the Dolphins still lead the AFC East standings at 3-1, while the Patriots are in second place at 2-2, and the Jets and Bills are tied at 1-3. The Dolphins have another road game against the Bengals and if they want to have a chance at winning they can’t bring this same performance to Cincinnati that they brought to Foxborough. The Bengals are also 3-1 tied with the Ravens at the top of the AFC North division. The Bengals just won a tight road game against the Falcons 37 to 36. This road game will be important to the Dolphins, this is not a must win but I will say this is a have to win game. This is another tough road game, even though they have a week to tighten things up the Bengals also have that week to prepare. This big loss to the Patriots will serve as a wake-up call and the team will be ready for the Bengals. Sunday October 7 it’s on.